This Friday we’re doing SOME of my favorite De La Soul tracks but I had to shine a little spotlight on a non album cut featuring fellow Native Tongue members, A Tribe Called Quest. Most of you already have this classic from 1994 in your possesion but for those of you that don’t It’s this weeks A+ Cut Of The Week! 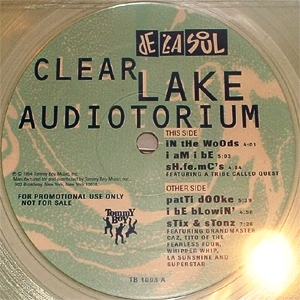 This cut samples High Power Rap by Crash Crew and you can only find it on The Tommy Boy Essentials Compilation and The Clear Lake Auditorium EP of which there were only 500 originals released. There’s been some black vinyl bootlegs since then but I think it’s an important cut that everyone in class should have so hit the title for the free download! Enjoy! ~ by Professor Mike on April 19, 2010.